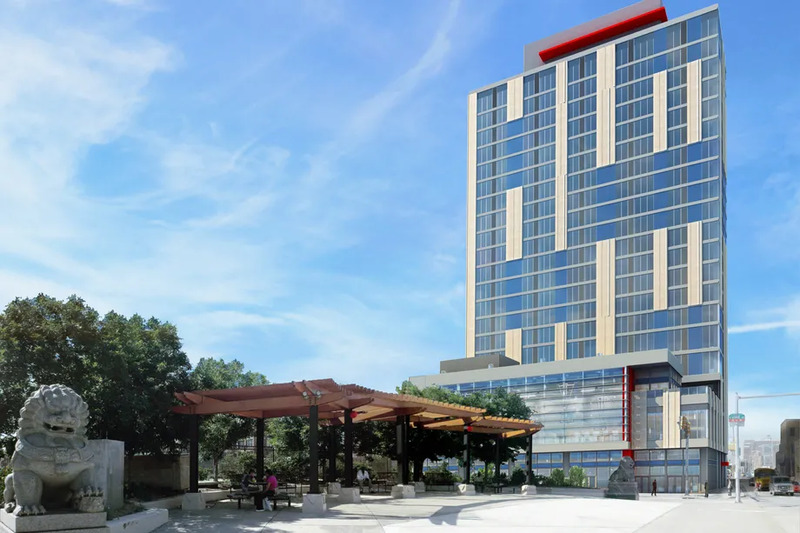 Construction has finally begun on a new 18-story tower on North Broad next to the Blue Horizon boxing venue, nearly a year after plans for the project were first announced. Construction crews at the northwest corner of Halsted and Van Buren in the Greektown corridor of Chicago’s West Loop are moving into high gear on a new 12-story development. 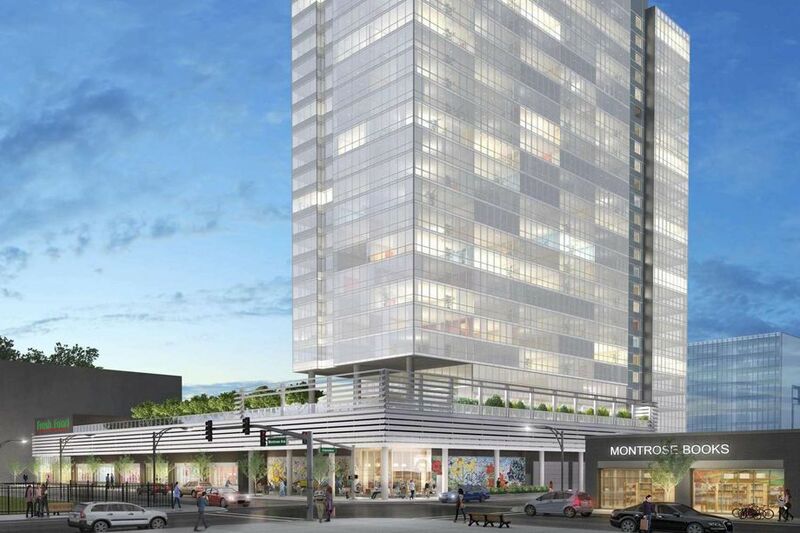 Known simply as “The Van Buren,” the transit-oriented project is expected to deliver 148 residential units, ground floor retail space fronting Halsted, and 65 interior parking stalls spread across its first and second levels. After 16 years, countless design proposals, years of fundraising, and navigating plenty hiccups along the way, Chinatown has officially and finally broken ground on the Eastern Tower Community Center at 10th and Vine. Once known simply as “808 West Van Buren,” The Van Buren will break ground in an official ceremony Wednesday morning at its Greektown construction site at Halsted and Van Buren Streets. One of our favorite construction projects of 2017 has reached a milestone. Construction at One Bennett Park, the condos-over-apartments stack at 451 East Grand Avenue has reached the 50th floor. That means with this latest concrete pour, the Related Midwest skyscraper is at 71% of its eventual 70-floor stature. If you’d like to measure its progress in height, then it’s up to 540 feet; or 65% of its eventual 836-foot height. There are two things we need to get used to about One South Halsted around the B.U.C. South Loop Bureau. First, we no longer have our stellar overhead perspective of the 44-story apartment tower from Fifield Companies and F&F Realty. 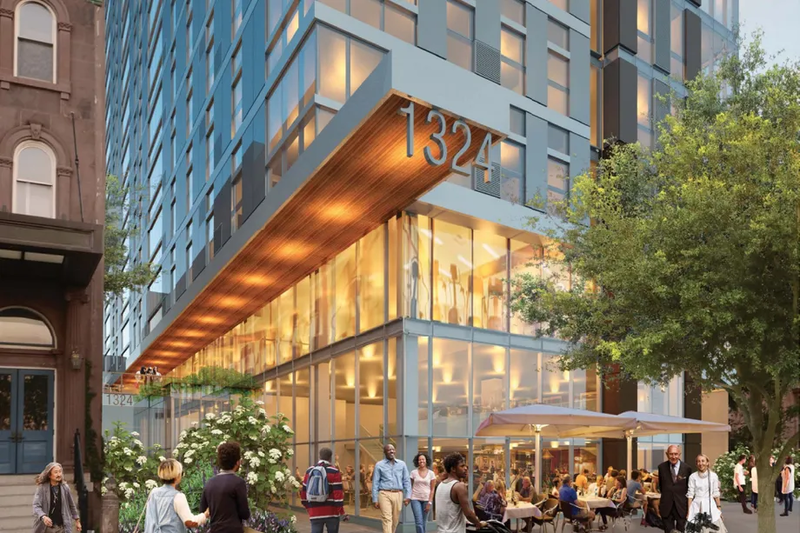 And second, it looks like we’ll need to stop using One South Halsted as a moniker, as it appears 727 West Madison is not only the address, but the name, of the project. No one asked us, but the extra syllables from that pair of 7s just don’t flow well as when you have a one-word number in the there. “One” plays. “One” works. Oh well. We’ll adjust. In the midst of ongoing progress at 1136 South Wabash comes new signage announcing a new name: 1136 is now Eleven40. Follow that link to a whole bunch of shiny new renderings of the SCB-designed tower, as it continues upward toward its ultimate 26 stories. The CA Ventures – Keith Giles production will have 320 apartments and is being built by Lendlease. Spring 2018 is the projected opening. The North Side’s next lakefront high-rise has been cleared to keep climbing towards its 27-story final height. Known as Eight Eleven Uptown, the development landed a full, $45 million construction permit yesterday. In the works for many years to replace the 3.4-acre vacant site of the old Cuneo Hospital—later home to Maryville Academy—at the corner of Montrose and Clarendon, the project received its first foundation permit back in February of this year. Forgive my faux pas. Must be all those yellow forms and the shiny yellow Liebherr adorning 1136 South Wabash that confused me. But it sure is hard to miss. 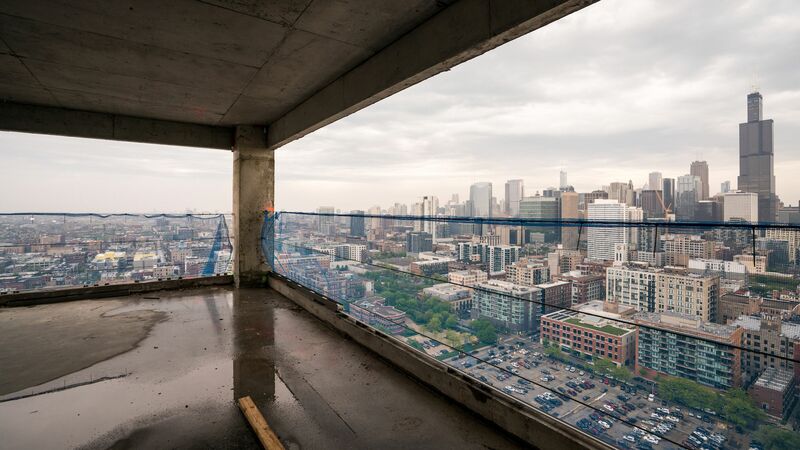 While the 30-story apartment building rising just north of the Eisenhower Expressway at 1035 W. Van Buren may not open until later this summer, developer Related Midwest was keen to get us on site for a sneak peek at its upcoming rental project. Dubbed Landmark West Loop, the 300-unit high-rise was designed by New York architect Morris Adjmi in collaboration with local architect of record GREC. The result is a bold and rather masculine looking building that would be equally at home in both Chicago’s West Loop and Manhattan’s Meatpacking District. A 30-story luxury apartment tower now under construction on Van Buren will begin leasing this summer. Called Landmark West Loop, the 300-unit apartment tower at 1035 W. Van Buren is expected to be the first new West Loop apartment tower to open this year when it opens in August, said Michael Ellch, vice president of Related Midwest. 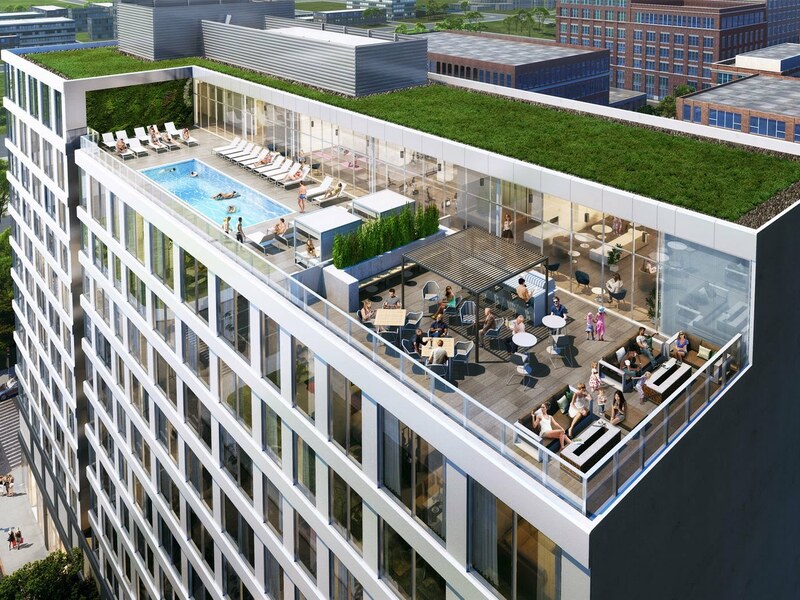 The apartment tower will offer a mix of studio, convertible one-, two- and three-bedroom units with a number of amenities including an outdoor pool. 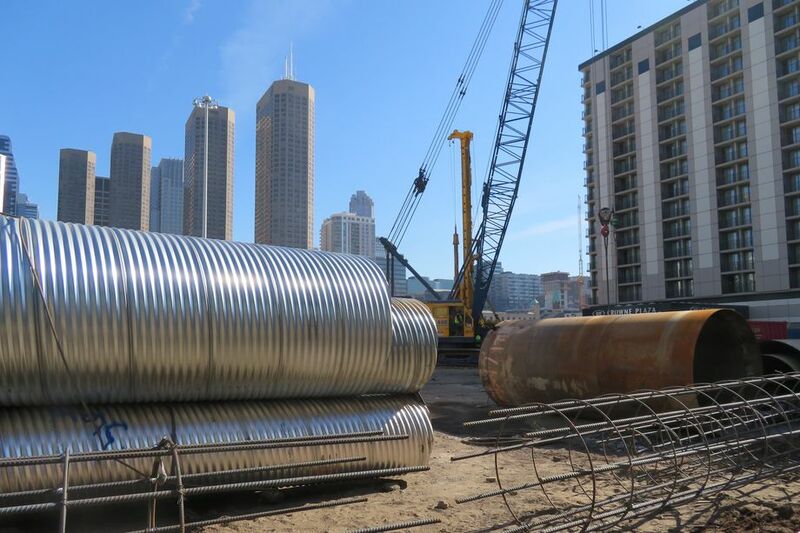 It’s been just over two weeks since the 44-story One South Halsted apartment tower landed a construction permit to begin work in Chicago’s Greektown neighborhood and workers are already taking advantage of our mild winter and drilling the building’s large caisson support system. Flanked by both a Whole Foods and Mariano’s, the building site is just west of downtown’s Kennedy Expressway. The cylinder-shaped skyscraper replaces a parking lot used by the neighboring Crowne Plaza hotel. The lot was closed days after the permit was issued. It’s not exactly a secret that One Bennett Park is one of our favorite recent projects in Chicago. It’s tall. It’s different-looking (for Chicago). It’s in Streeterville. What’s not to like? Chicago Office (Corporate) 2525 N. Elston Ave.